As Storm Emma closed in on Ireland groom Mark Davies told his bride, Tara McSwiney, that they would be married “come hell or high water”. Tara McSwiney and Paul Davies. NEWLY MARRIED COUPLE Tara McSwiney and Mark Davies have spoken of their immense gratitude after guests went to great lengths to attend their wedding in Dublin today. The couple tied the knot in Smock Alley Theatre in Temple Bar before having their reception at The Morrison hotel on Ormond Quay. Speaking on RTE’s Liveline programme bride Tara told presenter Joe Duffy that the couple conquered the weather and pulled off the wedding thanks to “sheer determination”. “My now husband, yesterday before he left, said ‘I’ll marry you tomorrow come hell or high water’ and that’s what we did,” she explained. Dublin woman Tara met Mark when she was studying for a Masters in Cardiff, where he is from. A lot of guests who were travelling from the UK couldn’t make the journey as flights were cancelled. Even apart from the weather other elements seemed to conspire against the wedding as Tara’s Maid of Honour fell ill and was in hospital. The stand in Maid of Honour, Hannah, who was travelling from Cardiff, went to extraordinary lengths to make it to the ceremony. She went to two different airports, only to be told that her flight was cancelled. She finally got a seat on a flight to Belfast and caught a bus to Dublin, eventually arriving shortly before midnight last night. Mark’s immediate family all managed to get to Ireland safely and his aunt and uncle also surprised him by showing up this morning. “A lot of people have made a really, really big effort to get here which is extremely heart warming and emotional for us both,” Tara said. Tara’s bridesmaids also stepped in and did her hair and make up after her appointments were cancelled. 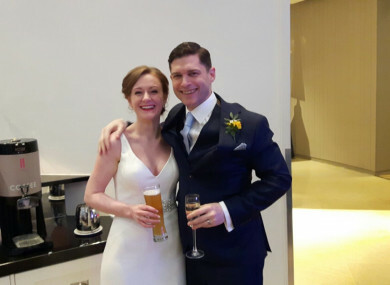 The couple told TheJournal.ie they are now celebrating their amazing family and friends and the tenacity and willpower of everyone involved, who worked so hard to make this a perfect day for them both. Belfast woman Aine Maher told TheJournal.ie about her wedding during the snow storms of 2010 when her father had to spend the three days before the ceremony clearing snow from Aine’s house to ensure the wedding could go ahead. “My Husband is from Co Clare, so all Conor’s family had to travel in one of the worst snow blizzards ever,” she explained. “Our groomsmen and bridesmaid had to also to travel to Belfast and we had friends travelling from all over the country and the world. Yes, we lost some people along the way but we kept a positive attitude. We all came together and made it happen. It was amazing in the end, our photos turned out like a winter wonderland. Email “White wedding: This couple tied the knot just before Dublin's 4pm 'curfew' today”. Feedback on “White wedding: This couple tied the knot just before Dublin's 4pm 'curfew' today”.